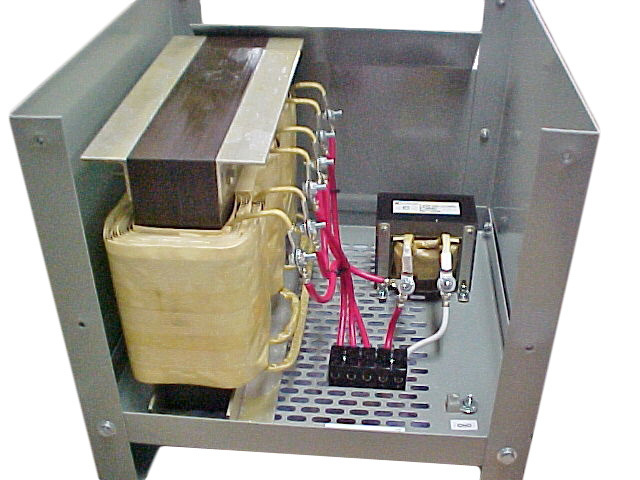 Grounding (or Zig-Zag) Custom Transformer Model 215033 shown with cover removed on NEMA 1 enclosure. Also included is a 393 mohm 60A "neutral" inductor (smaller magnetic shown). The application is for the creation of a missing neutral connection from an ungrounded 3-phase Delta system to permit the grounding of that neutral to an earth reference point; also to reduce harmonic content. During a phase to ground fault the zig-zag transformer’s coils magnetic flux are no longer equal in the faulted line. This allows zero sequence current to now flow from the point of the fault to ground and return to the zig-zag transformer’s neutral.